Don’t let the blazing sun or harmful UV rays keep you from enjoying your deck or patio. A SunSetter Retractable Awning gives you cool, comfortable shade and 99% UV ray protection in seconds. (It can be as much as 20 degrees cooler under a SunSetter). Yet it retracts easily when you want to enjoy the sun. A SunSetter helps keep the inside of your home cooler, too, and helps cut your air conditioning bills by keeping the hot sun from entering windows and sliding glass doors. A SunSetter Awning will let you enjoy the outdoors more than ever before. It creates the perfect “outdoor room” where you’ll love to eat, entertain, or simply relax in comfort. It gives kids and pets a protected place to lay. No need to take it down in winter or when not in use – just retract it back against the house. There are hundreds of thousands of satisfied SunSetter customers across the country. In customer reviews, SunSetter Awnings have earned an impressive 4½ stars out of 5! 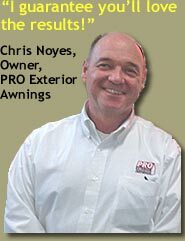 Click here to read what our awning customers say! When it comes to retractable awnings and custom awnings, awnings fabrics, and awning installation and repair in the greater Cape Cod area, PRO Exterior Awnings is the only name you need to know. 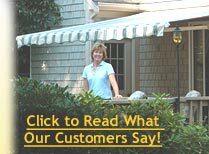 We are your authorized hometown SunSetter Awning dealer, offering sales and professional installation of SunSetter Retractable Awnings – the #1 best-selling awnings in America, in Cape Cod and the surrounding towns. We’re the #1 SunSetter Dealer in the area. We sell more SunSetters than anyone else on the Cape. We also sell and service replacement fabrics, motors and accessories like wireless wind sensors and awning lights. Click here to see a demonstration of SunSetter’s exclusive dimming LED lights!